Suppose you want to get a loan to buy a car? What would you want to know about the loan? Would you want to know the amount of your monthly payments? Would you want to know how much you would have to repay including interest? In this lesson, you will learn how to calculate simple interest. 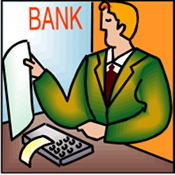 When banks use simple interest they consider the principal, the interest rate, and the length of time of the loan. In this lesson, you will learn how banks calculate the amount in dollars you will repay when you borrow money. So, how do banks calculate the amount of interest paid on a loan? In this lesson, you will view a Livescribe Pencast and/or Youtube Video to learn how to find the dollar amount in interest that is due at maturity. This lesson uses different time periods such as days, months, and years in the calculation as well as varying interest rates. In this lesson you will learn how to calculate the interest in dollars when given the principal, rate, and time for a loan. The principal, interest rate, and time will vary so reflect changing economic conditions. You will be calculating simple interest on small loans, converting the interest rate expressed in percent to a decimal, expressing time as a ratio when time is expressed in days and months, and finding the total amount due in dollars when the loan matures. 1. 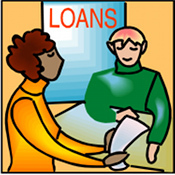 Your teacher will instruct you how to calculate the interest in dollars on a loan. The interest that will be shown to you is called "Simple Interest." Make sure you understand how to express the interest rate as a percent. Make sure you express time as a ratio when time is expressed in days and months. 2. Your teacher will present several practice problems in class. Have your calculator ready so you can learn how to make sound financial decisions when applying for a loan. 3. Use the resources to review how to calculate simple interest. One of those is a YouTube Video (if your school allows it). The other link is the Pencast located on the right, which can be viewed by pressing the "play" button. Complete any reading in your textbook if your teacher assigns it. If not, complete the reading on the Worksheet that gives you examples how to make simple interest calculations. 4. Complete the Worksheet distributed by your instructor. 5. If your teacher requires it, complete the extension activity as required by your teacher. In this lesson, you have learned how to calculate simple interest. This knowledge will help you make informed financial decisions when using credit. As you have seen, the higher the interest rate or the longer the time period of the loan, the higher the interest in dollars. You will find it wise to shop around for the best rate that will allow you to use the principal but make repayment easier. Your teacher will evaluate the Simple Interest Worksheet completed in the Process section based on the number that you got correct. 2. Inquire at your bank what the interest rate is on a home with a 30-year mortgage and report it to the class. Also, inquire at your bank what the interest rate is on an automobile loan for three years and report that to the class. Be sure to take in the proper mortgage and automobile loan situations to your bank, and record these rates on something that you can bring back to class.